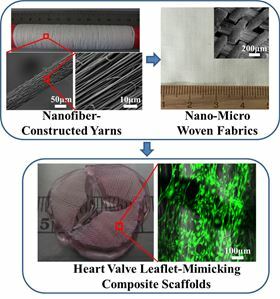 Fabrication of nano-micro fibrous woven fabric/hydrogel composite scaffolds and their potential for heart valve engineering. Upper panel: PAN nanofiber yarns were fabricated using a modified electrosping setup. They were turned into a nano-micro fibrous woven fabric by using textile weaving technique. Lower panel: tri-leaflet was generated using bioactive hydrogel with fibrous woven fabric reinforcement. Human aortic valve interstitial cells were encapsulated with high cell viability. Materials that mimic the biological and physical properties of heart valve tissue could help repair and regenerate damaged or diseased valves. A team of Chinese and US researchers have designed a composite that they believe could hold the answer [Wu et al., Acta Biomaterialia (2017), doi: 10.1016/j.actbio.2017.01.051]. “Heart valve-related disease is an important clinical problem, with over 300,000 surgical repairs performed annually, but the currently-used valve replacement devices remain a clinical challenge for the regeneration and repair of diseased heart valves,” explains Jonathan T. Butcher of Cornell University, who led the research. Together with coworkers from University of Nebraska Medical Center, Donghua University and the Key Laboratory of Shanghai Micro and Nano Technology in China, Butcher has developed novel composite scaffolds consisting of a nano- and micro-scale woven fabric and three-dimensional hydrogels. The composite is fabricated in a two-step process starting with the electrospinning of fibrous polymer yarns. The yarns can be made from a range of polymers, but the team focused on polyacrylonitride (PAN) because of its biocompatibility in vitro and in vivo. The researchers then wove the nano- and micro-fiber yarns into a fabric. Unlike a simple electrospun fabric, where the fibers are in a spaghetti-like tangle, the nanofiber yarns are aligned in one direction with the microfiber yarns at a right angle, mimicking the anisotropy of the extracellular matrix (ECM) of human aortic value tissue (or ‘leaflet’). In the second stage of fabrication, the woven fabric is impregnated with a living cell-laden hydrogel (methacrylated hyaluronic acid/methacrylate gelatin or Me-HA/Me-Gel) and exposed to UV light, crosslinking the polymer to form a stable composite. The physical attributes of the scaffold support cell migration and vascular growth in the scaffold, as well as facilitating the transport of nutrients and oxygen to cells and removal of waste. Moreover, using different polymer yarns to make the fabric opens up the possibility of creating fabrics with controlled strength, porosity, structure, and shape to match the requirements of different tissue types. Meanwhile, the bioactive hydrogel helps maintain the growth and proliferation of heart valve cells and protects against device shrinkage and calcification. The researchers believe that the approach could go beyond heart valve treatment, aiding in the repair and regeneration of skin, blood vessels, and skeletal muscle. The team have already produced biodegradable fibers and nanomeshes, and are undertaking further animal studies. New high-precision sensor measures changes in magnetic fields.